The Willis Bridge is on SH-99/U.S.-377 and connects Madill in Marshall County, Okla., and Whitesboro in Grayson County, Texas. 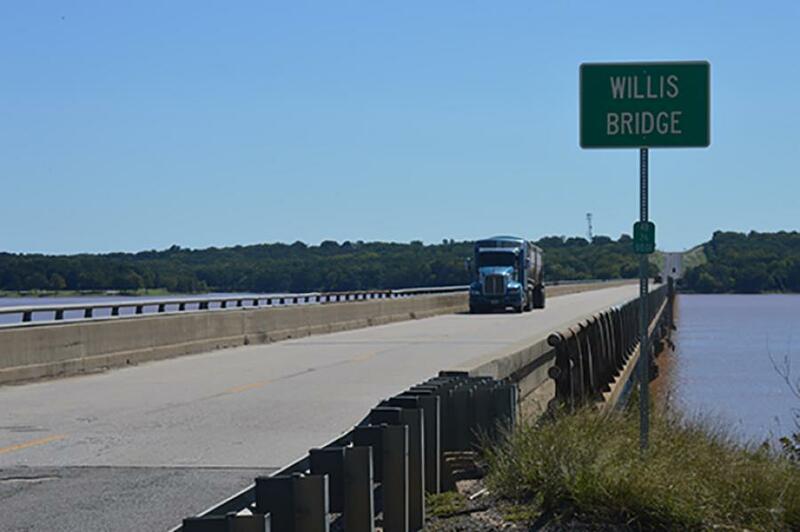 A $43 million contract to replace a mile-long, 58-year-old bridge over Lake Texoma that links Oklahoma and Texas was awarded by the Oklahoma Transportation Commission. Jensen Construction Co. of Sand Springs was the lowest of eight bidders for the job at $43 million. Five of the other companies are Texas contractors, one is from Kansas and another is from Florida. The Willis Bridge is on SH-99/U.S.-377 and connects Madill in Marshall County, Okla., and Whitesboro in Grayson County, Texas. The replacement structure will be wider and longer than the existing one and will be built to the east. The project also will include construction of the approaching roadway at each end of the new bridge and demolition of the old bridge. The new bridge will be 5,462 ft. long with two 12-ft.-wide driving lanes and 10-ft.-wide shoulders on each side. The tallest of the 38 piers that will support the bridge deck will extend about 80 ft. from the top of the bridge deck to the lake bed. The existing bridge was completed in 1960 and is in poor condition. "This bridge requires maintenance on a regular basis which can have economic impacts and affects the traveling public. We're pleased to see this new bridge begin; it will far outlive its predecessor," said Anthony Echelle, Division 2 engineer of southeastern Oklahoma. Construction is expected to begin in early 2019 and will take about two and a half years to complete, pending weather conditions and other factors. The cost of the project is expected to be financed with federal funds and with Texas and Oklahoma sharing the cost. Motorists will continue to drive on the old bridge until completion of the replacement bridge and the approaching roadway at each end is finished. About 2,800 vehicles travel across the Willis Bridge each day. The Willis Bridge is the longest state-maintained bridge in Oklahoma. The Red River bridge in Tillman County on U.S.-70/U.S.-183 is slightly longer, at 5,580 ft., and it is maintained by the Texas Department of Transportation. The bridge receives its name from the local community of Willis on the Oklahoma side.